Named after a multilayered stone, Blu Dot's Shale combines solid-wood components with full-grain leather pulls that are soft to the touch. 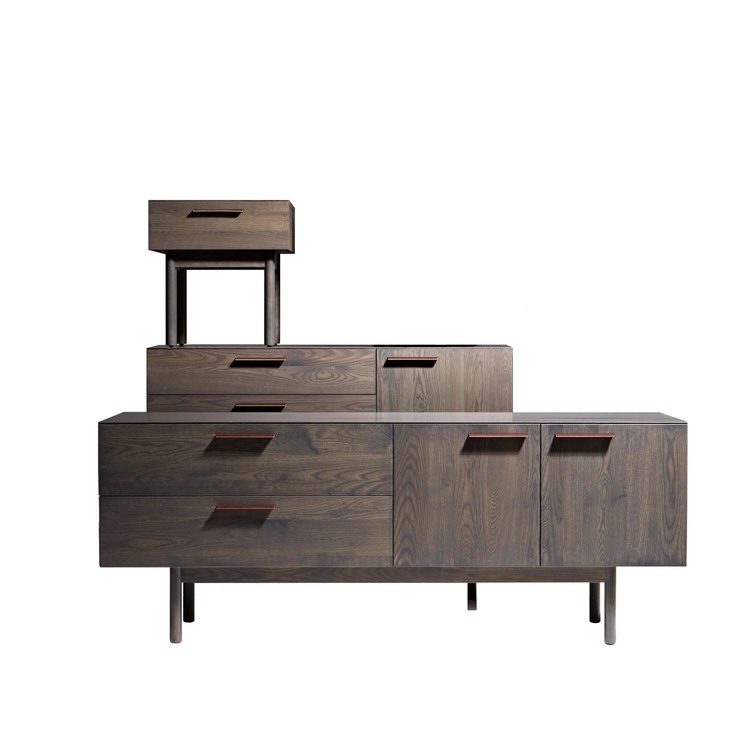 Available with two or four drawers, in ash or walnut, the piece features dual doors with nylon glides. 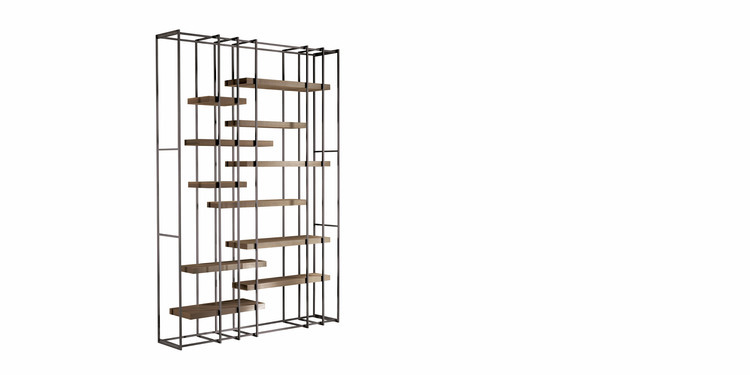 Avenue Road's Cage-B shelf is available in burnished brass, black steel, or brick-red or dove-grey lacquer, with oak, black eucalyptus, acacia, or chestnut shelves. The unit is handmade in Italy, the home country of its designer, Massimo Castagna. 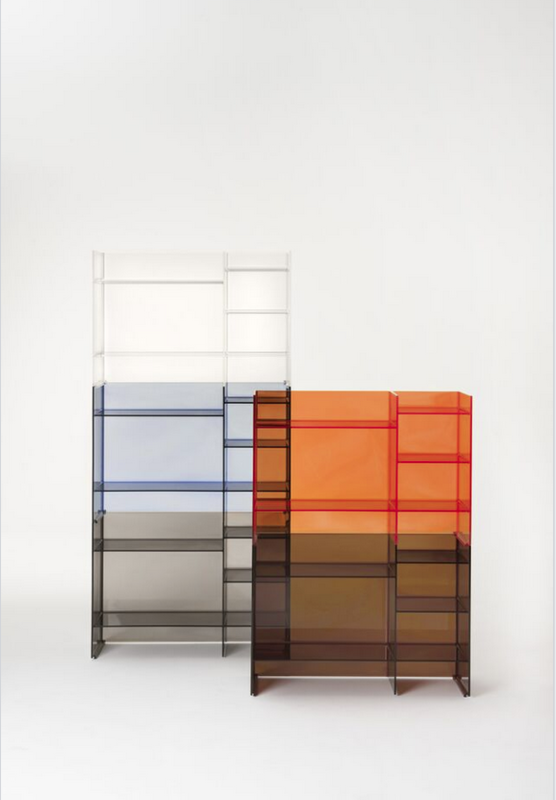 Cappellini's Candy shelf, designed by Sylvain Willenz, recontextualizes the steel rods found on construction sites. Coated steel bars join conglomerate and birch plywood panels to form a shelf referencing '60s industrial style. Evoking a deconstructed aquarium, Glas Italia's Deep Sea shelf by design collaborative Nendo is made of laminated extra-light glass. From top to bottom, the distance between shelves decreases with each level, while the color intensity increases. With tapered edges and a finlike shape, Mamba Light is a playful addition to designer Victor Vasilev's work for DDC. Made of medium-density fiberboard in seven colors, the shelving unit is an accent piece to last year's Mamba desk. 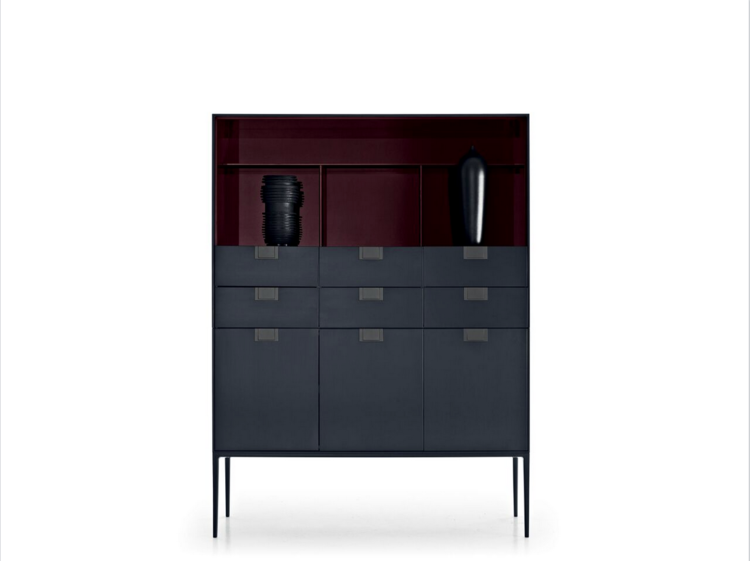 Molteni & C's 505 system welcomes a new container designed by Nicola Gallizia. Black chrome feet support an aluminum frame and surface. Interior partitions and shelves are customizable, and the unit is available in two heights, four depths, and 10 widths. Reflective surfaces and bronzed details make Antonio Citterio's Orione for Maxalto a contemporary take on the aesthetic of the 1940s. Within its wooden doors, the unit features bronzed-glass shelves and an internal frame finished in smoked oak. 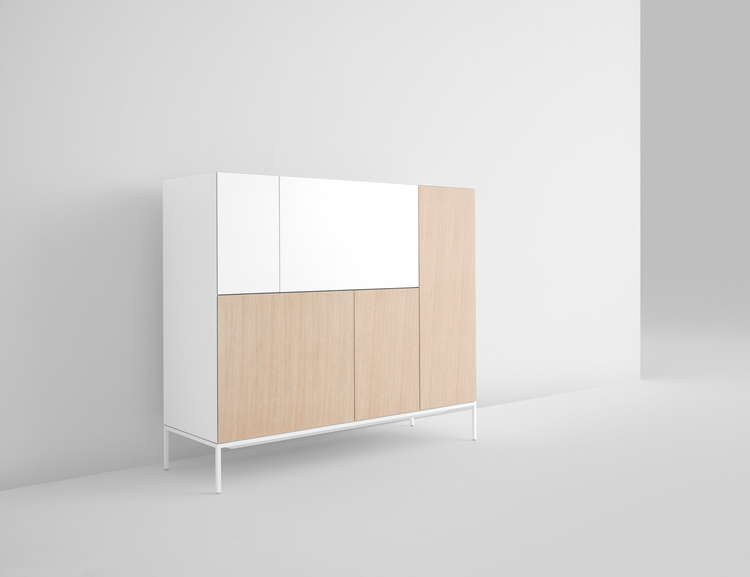 The leaf doors of Poliform's Tess wardrobe are covered in melamine-coated fabric, making them resistant to damage while evoking a light elegance. New finishes come in grigio and nocciola. Shelves inside the unit can be arranged to fit a variety of needs. 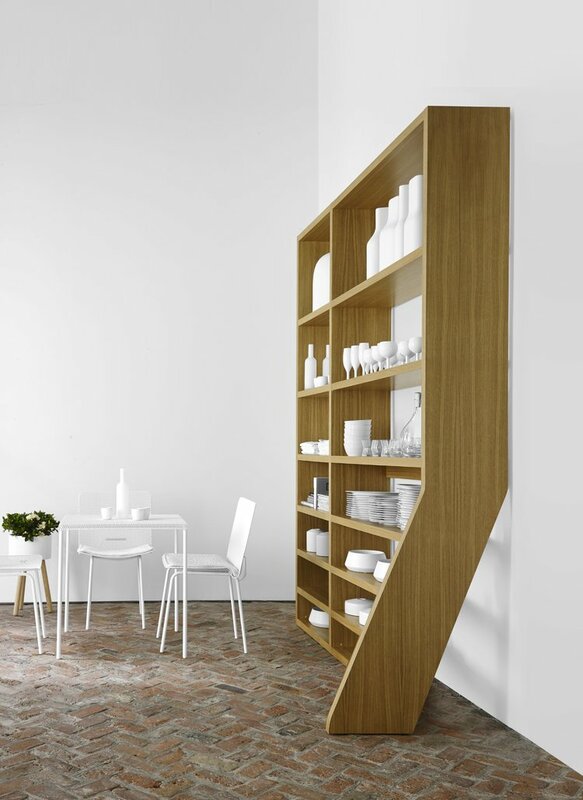 The Tolbiac shelf unit, available in natural or black-stained oak veneer, is not your average study in geometry. Grégoire de Lafforest's design for Ligne Roset was inspired by a staircase, with the bottom corner of the structure canted like one. Made of a powder-coated steel frame and ash veneer top, the Tilt Top by Scholten & Baijings for Hay is a twist on the classic Dutch table. An underside color gradient makes it pop, even when stowed away. 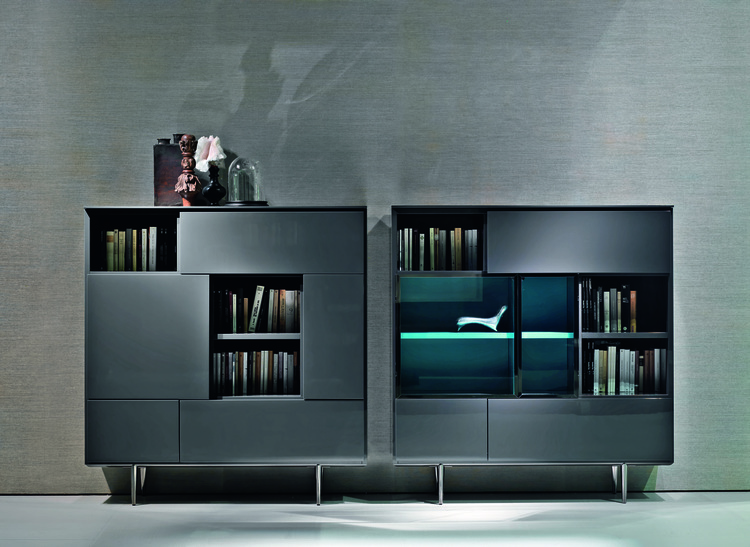 Deep contrasting color lacquers and open shelves give B&B Italia Maxalto's Alcor storage unit a rich elegance. Part of the Lux collection, the wood frame comes in black or red painted shellac finish. Newly extended with additional finishes and shapes, Luca Nichetto's modular Torei tables for Cassina include varying heights, allowing for interchangable arrangements. Tray tops come in stained wood and Carrara marble. Reissued by Carl Hansen & Son on the occasion of Hans J. Wegner's 100th birthday, the CH825 Wegner credenza has roller shutter doors that reveal interior shelves and pullout drawers. It comes in solid oak or walnut. 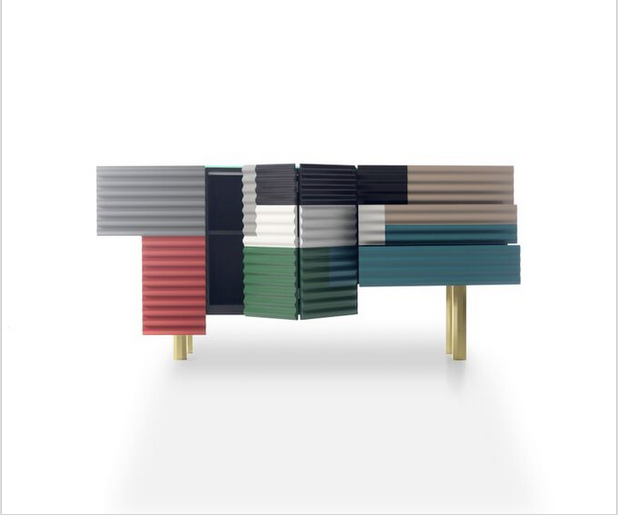 Doshi Levien's Shanty credenza for BD Barcelona takes its inspiration from improvised dwellings from around the world. Its corrugated panels and collage of colors find beauty in the patchwork aesthetic. Simplicity of forms and materials lend Barber Osgerby's Wood table for Vitra an understated elegance. Oval profile legs and aluminum bridges also make it super stable, and prevent its solid wood top from warping. 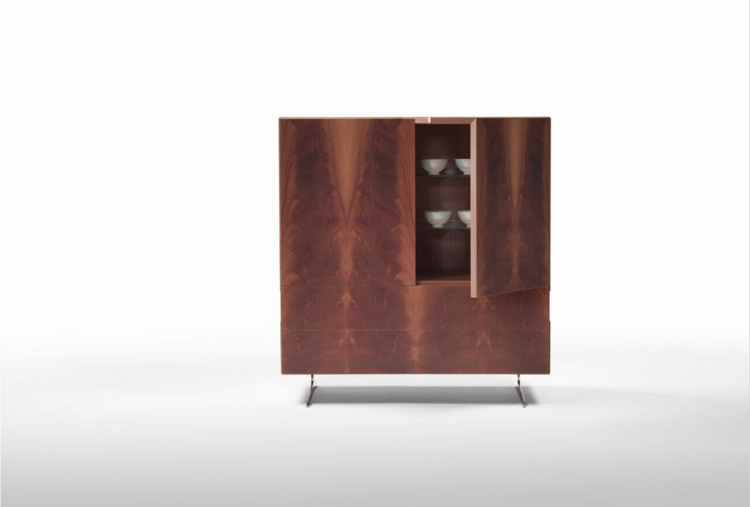 Made of a rich feather mahogany, Antonio Citterio's Piuma cupboard for Flexform is also available in ash and solid Canaletto walnut. It's part of a larger collection that includes a TV table and drawer set. Designed by Reed and Delphine Krakoff, the Felt series for Established & Sons applies an unusal choice of material - gray felt - to the dining room. Its intricate stitch detailing and soft texture offer a tactile warmth. Part of a collection of side tables, Nendo's hybrid Basket container provides dual function. Made of individually hand-bent wires, the basket top may be easily detached and used separately. Designed by Stockholm-based duo KyuHyung Cho and Erik Olovsson, the Sine collection of clothing racks is a study of pleasing contrasts: straight and wavy, austere and playful, heavy and light, steel and concrete. USM's modular Haller system was designed by Fritz Haller and Paul Schaerer in 1963. Now available in 14 colors and myriad configurations, it's still made of only three elements: a chromed brass-ball joint, chromed steel tubes, and powder-coated steel panels. The Vision Elements Jubilee cabinet celebrates the 100th anniversary of Dutch furniture maker Pastoe, drawing inspirations from Cees Braakman's desk-cabinet designs. The Jubilee highlights he collection's trademark handless-cube design.